Wet Ride excels over long distances and in the most extreme weather. Wet Ride is a thicker, heavier bodied lubricant that is totally waterproof. Wet Ride is made using only premium synthetic oils and water repelling polymers. The result is a lubricant with unmatched film strength. 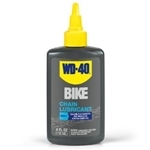 An extreme lube; super durable high viscosity synthetic oils, special polymers, anti-wear additives, friction modifiers, and more, all combine to make this Finish Line strongest, longest lasting, most water resistant lubricant. WET Lube goes on wet and stays wet on the chain. Recommended for long-distance riding and extreme weather conditions.